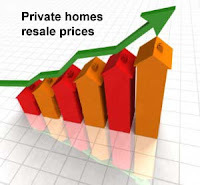 Resale prices of private homes continue to rise in the second quarter of this year. According to DTZ Research, resale prices of private residential properties increased at a faster rate across all segments in the second quarter of this year compared to the first. It says the average resale price of leasehold condominiums in the suburban areas rose the fastest by 3.9% on-quarter, compared to 0.8% in the first quarter. The average resale price of freehold condominiums in the prime districts of 9, 10 and 11 grew by 3.3% on-quarter compared to 0.4% in the first quarter, based on a basket of completed condominiums tracked by DTZ Research. The average resale price of luxury condominiums rose the least at 1.7%. But DTZ Research said it reflected an increase over the flat prices registered in the first quarter. This it said is the only segment with prices still below the 2007 peak. Ms Chua Chor Hoon, Head of DTZ South East Asia Research, said prices continue to trend upwards because sellers are benchmarking against the prices of new launches. No Comment to " And the price of resales keep on rising... "